The following section is meant to give you a flavor of what it is like to work on a volcano. 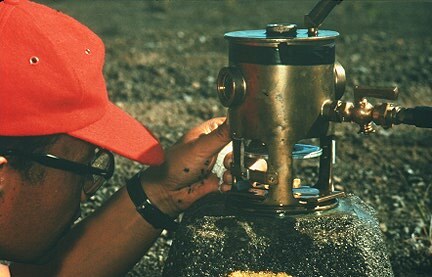 It illustrates some of the techniques that are used to study active Hawaiian volcanoes, most of which are also used to study the rest of the world's volcanoes. Keep in mind also, that there are lots of indoor techniques that are equally important for understanding what a volcano is doing. Important examples of these are the analysis of seismic signals and geochemical studies of erupted lavas and gases.